The SDL550 monitors moisture in Grain, Corn, Rice, Cotton, Paper, and other materials. 23.7″ (600mm) Heavy Duty Stainless Steel Probe with Replaceable Probe Head and inner filter. Measures Moisture Content, Air Temperature, Dew Point and Temperature. Moisture content measurement from 10 to 95%. Datalogger date/time stamps and stores readings on an SD card in Excel format for easy transfer to a PC. Adjustable data sampling rate from 1 to 3600 seconds. Stores 99 readings manually and 20M readings via 2G SD card. Type K/J Thermocouple input for high temperature measurements. 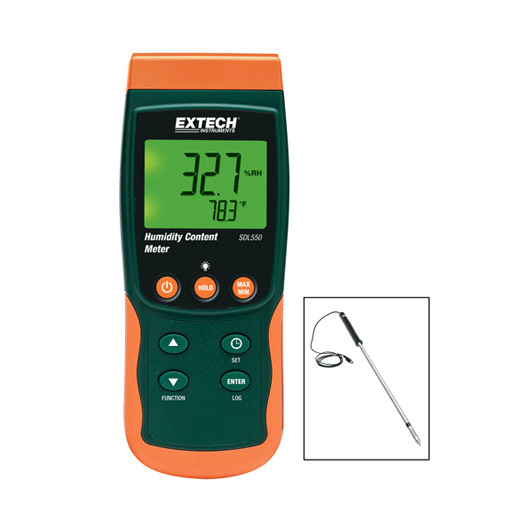 Large backlit dual LCD display simultaneously displays moisture content and temperature. Record/Recall MIN, MAX, Data Hold, and Auto Power Off functions. Complete with Moisture Content Probe with 4.9ft (1.5m) cable, sensor cap, SD card, 9V battery and soft carrying case.